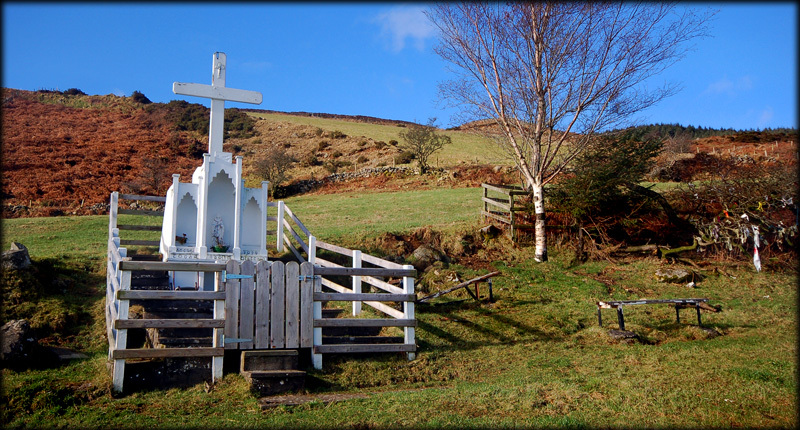 The Holy Well on the slopes of Slieve Gullion is known by several names, all relating to St Moninna. 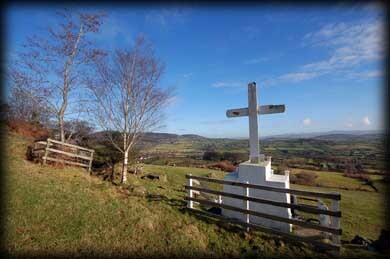 The saint had established a church in the valley below at Killeavy. Although I was blessed with good weather for my visit, I would not recommend visiting the well during the winter months. The 600 metre climb up to the well is very steep and on this occasion very wet and in places quite muddy. Traditionally, a pilgrimage would take place to the well on 6th July, the Saint's Pattern day. After the suppression of the Pattern in 1825, the existence of the Holy Well was forgotten about but it was re-discovered by Father James Donnelly, C. C. Meigh in 1880. An inscription on the Shrine at the Well now reads "Tobar Naoimh Blathnaidh" yet another name for this well. The Pattern was revived in the year 1928 and survived until 1934. I was delighted to find the well in excellent condition and noticed quite a few rags tied to the tree to the north of the well. St. Moninna (aka St Bline, St Darerca, St Moninne and in Scotland as St Edin ). Her father was Machta king of the territory, stretching from Louth to Armagh. Her mother was Coman, the daughter of a northern king. St Moninna lived from c.435-518 AD. She moved to the west of Ireland to join St Ibar. When St Ibar moved to Wexford she followed but stopped off at Kildare where she met St Brigid. She then traveled north and established her first convent at Faughart, the birth place of St Brigid. In later life she moved to Armagh and established a convent in Killeavy, where she is believed to be buried in the Churchyard. Situated: From Killeavy Churches take the track to the north, running alongside the wall. The track goes straight up and then turns to your left. Go through a gate. You will then pass Winifreds seat. The track turns to the right and you can see the well. Discovery Map 29: J 0365 2185. Last visit February 2011.